Every Sunday in black churches across America collection plates are passed and parishioners insert their tithes and offerings. The very next day, as those funds are deposited in church bank accounts, the transfer of millions of dollars occurs as those funds are placed in financial institutions that are not owned by African Americans. However, the weekend’s wealth transfer does not end there. It continues throughout the remainder of the week as the majority of mortgage companies, landlords, insurance companies, and vendors most black churches utilize are also not African American-owned. This wealth transfer, estimated at billions of dollars per year, occurs largely unconsciously but its impact is enormous. The transfer would not be so problematic if a reciprocating money stream was flowing from other communities into black-owned enterprises. In other words, if churches from other ethnic groups were collecting funds each weekend and transferring them to black-owned banks and businesses, the two realities would be balanced, with essentially one cancelling out the other. Instead all of the funds are moving in one direction—away from black communities and entrepreneurs. This book is the second installment in a series on group economics, the missing link and Achilles heel of African-American economic progress. The first installment, Why African Americans Can’t Get Ahead: And How We Can Solve It With Group Economics, was published in 2008. 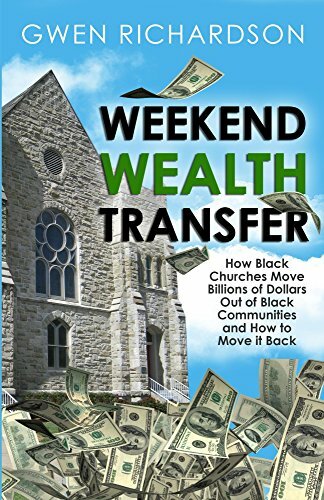 The purpose of this book is to explore the economic impact of the transfer of wealth away from black communities via the black church, its impact on those communities, and strategies to reverse this trend.